TORONTO/NEW YORK (Sept. 16, 2016) – The World Cup of Hockey Trophy, designed by world-renowned architect Frank Gehry, was unveiled this evening by legendary Canadian hockey icon Paul Henderson at the Pepsi World Cup of Hockey Premiere Party at Scotiabank World Cup of Hockey Fan Village, which was attended by the fans as well as players from all eight teams competing in the World Cup of Hockey 2016. The unveiling of the trophy heralds the World Cup of Hockey 2016, which gets underway tomorrow, Sept. 17 in Toronto. 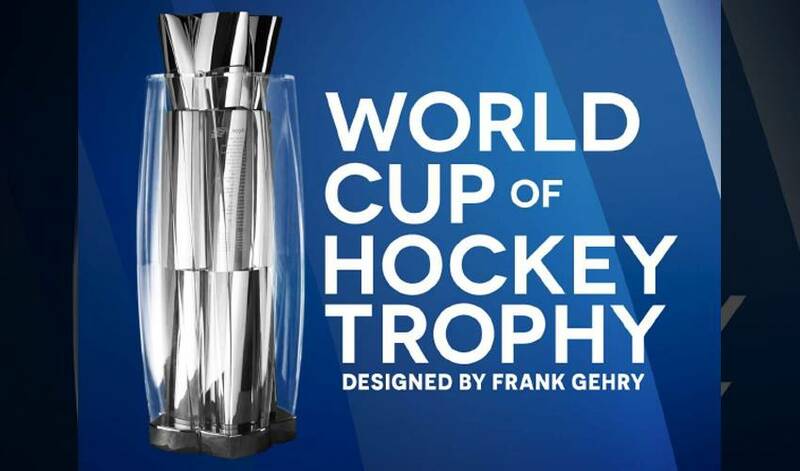 The World Cup of Hockey Trophy is a refined and remade design from the 2004 trophy. In its creation, the trophy incorporates innovative use of materials, fabrication processes, and technology in its creation — much like the sport of hockey itself. Gehry, a Toronto native, was specially commissioned by the National Hockey League Players’ Association (NHLPA) and National Hockey League (NHL) to design the trophy due, in part, to his lifelong passion for hockey. A labour of love, the trophy was designed and fabricated with meticulous attention to every detail — from the sculptural form and graphics, to considering the way it will be lifted on the ice. Gehry Partners’ design process consisted of two parallel paths: the first part was to evaluate the form of the trophy to accommodate legible engravings through a transparent shell; and the second study required research into the material and fabrication. Gehry Partners used the same iterative design process for the World Cup of Hockey Trophy as it uses for all of its projects. Three-dimensional computer models were created to study the weight and quantity of materials, while multiple physical models and digital imagery served as an important collaboration tool between Gehry Partners, the NHL and the NHLPA, to refine the design. The final design for the trophy resulted in a stainless steel base, body, crown and transparent acrylic shell, which was intended to evoke the feeling of a traditional trophy while it was composed in a uniquely contemporary way. Stainless steel was chosen for its durability, timelessness and ability to polish to a mirror finish, and acrylic was chosen for the shell because of its transparency, weight, durability and how it responded to UV light over time. The World Cup of Hockey Trophy, using state-of-the-art fabrication techniques, seeks to capture both the toughness and the elegance of the sport, with a design that embodies the exceptional skill, commitment, and fortitude required of a winning team. Weighing in at 32 pounds and measuring 26.5 inches tall, the tower of stainless steel gleams with rising curves of perfectly clear, solid cast acrylic, which is laser-etched with the names of the 1996 and 2004 World Cup of Hockey champions. The logo plate on the bottom will be updated for each tournament. The body of the trophy, composed of two identical drums, was designed specifically for engraving, and can accommodate the etching of 10 tournament winners. The crown, the most pronounced aspect of the trophy, takes the form of a chalice design to secure the acrylic shell in place. Paul Henderson, who presented the World Cup of Hockey Trophy, is best known by hockey fans for leading Team Canada to victory in the historic 1972 Summit Series against the Soviet Union. He scored the game-winning goal in the sixth, seventh and eighth games, but it was the last goal that made him a national hero to Canadians — it was voted “sports moment of the century” by The Canadian Press in 2000.